searched answers to topical questions of Ukrainian and world German studies. 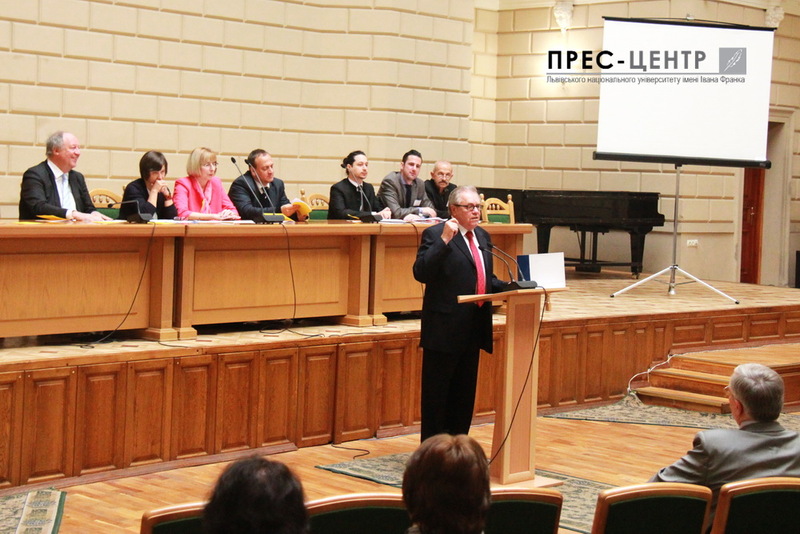 The grand opening of the XXIII International Conference of the Association of Ukrainian Germanists was held on October 4-6, 2016 at Ivan Franko National University of Lviv. Professor Alla Paslavska, the President of the Association of Ukrainian Germanists, welcomed the participants of the conference and wished them interesting, intensive work and good impressions from the stay in Lviv. “The holding of the 23rd International Conference of the Association of Ukrainian Germanists at Lviv University is a manifestation of the rich tradition and great potential of the Lviv School of Germanic Studies,” – said Rector, Professor Volodymyr Melnyk. According to Volodymyr Melnyk, the development of the German language in Ukraine and especially in Lviv and Lviv University is nowadays depicted not only as the format of communication tools but is also positioned as a potential development and deepening of Ukrainian-German intercultural dialogue. Mykhailo Moroz, the acting Head of the Department of Culture of Lviv City Council, stressed that for a long time Lviv has been a centre of German language and culture in Ukraine. “Thanks to the efforts of the Ukrainian Germanists, Lviv is actively cooperating with Germany and Austria, carrying out a number of joint projects in various spheres”, – he said. Oksana Kovalenko, chief specialist of the Department of General Secondary and Preschool Education of Ministry of Education and Science of Ukraine, said that a joint statement between the Ministers of Foreign Affairs of Ukraine and Germany will soon be published. According to this statement, the next year 2017 will be the year of German language in Ukraine and Ukrainian language in Germany, which is the evidence of the close and productive cooperation between the two states. The partners of the Association of Ukrainian Germanists welcomd gladly the participants of the conference: Andreas Wenninger, Head of the Representative Office of the Austrian Exchange Department in Lviv, Attaché for Science and Education of the Embassy of Austria in Ukraine; Hans-Peter Niedermeier, Head of Hanns Seidel Foundation’s Institute for Scholarship Programmes; Michael Beck, lecturer of the German Academic Exchange Service; Dominik Wolf, consultant and program coordinator of the DSD in northern and central Ukraine. On behalf of the Embassy of Germany in Ukraine, Myroslava Diakovych, Honorary Consul , congratulated the community of germanists with the beginning of the conference, noting its symbolism. “The German language in the territory of Western Ukraine and particularly in Lviv and Lviv University has a long tradition. Therefore, these scientific meetings indicate that in the future German language will have broad prospects for development,” says Miroslava Diakovych. Professor Wolfgang Mihailescu greeted participants on behalf of the the Romanian Union of German Studies. Professor Bohdan Maksymchuk, the Chairperson of the Department of German Philology, expressed gratitude to the colleagues for cooperation and development of Germanic studies in Ukraine. Especially warm words of gratitude were addressed to the representatives of the University of Erlangen-Nuremberg together with wich a yearly colloquium for young scientists-germanists has been held for seven consecutive years. After the official opening of the conference the participants continued the work in the format of breakout sessions, considering topical issues of the modern trends of didactics and methodology of teaching German in secondary and higher schools, linguistics, literary studies, stylistics and translation studies. Association of the Ukrainian Germanists together with the publishing house Hueber held a drawing contest calendar ” My Favorite German Proverb”. Olha Kryshtan, a schoolgirl from Zhytomyr, won the victory. The ceremony of awarding the winner was held during the celebrations to mark the opening of the 23rd International Conference of the Association of Ukrainian Germanists “The German Language: Traditions and Prospects”.